← Home alone? Not quite. One way to handle switchable barrels. This 455Lux rifle is in 22WMR. It also accepts a 22LR barrel — with its own sights — and appropriate magazines. Plink with cheaper ammo, bust tree rats with faster 22 Magnum. Don’t have to re-zero. 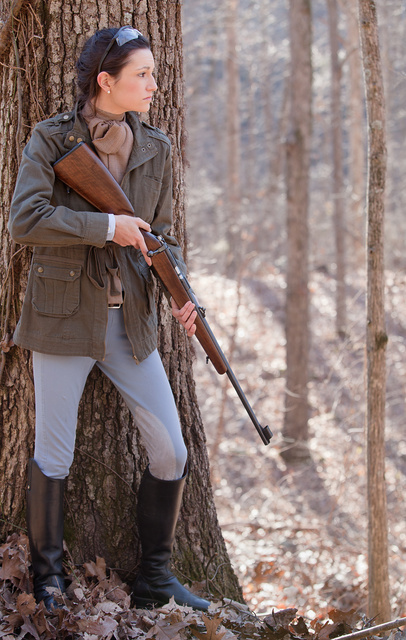 This entry was posted in hunting, nature, rifle and tagged 22LR, 22WMR, bolt action. Bookmark the permalink. 3 Responses to One way to handle switchable barrels. Looks like it would be a truly useful setup! The .22 WMR is quite a round from a rifle- or carbine-length barrel. With a .22 LR/WMR rifle, you can also cope better with ammo shortages. For a while here, the .22 LR was unavailable, but boxes of .22 WMR sat on the shelf. The take-down and switch-out procedure does seem a bit fiddly, though the price is hard to beat. Oleg, though I love just about all the work I see from you, I don’t think any firearm matches the look of your work better than CZ’s stuff. It was a match made in gun Heaven. You do a magnificent job showing the lines and elegance of the firearm and your model selection always matches them perfectly. Its just great and about 9 gazillion times better than some of the hack photoshop jobs companies put on a lot of their marketing stuff. Its just great.